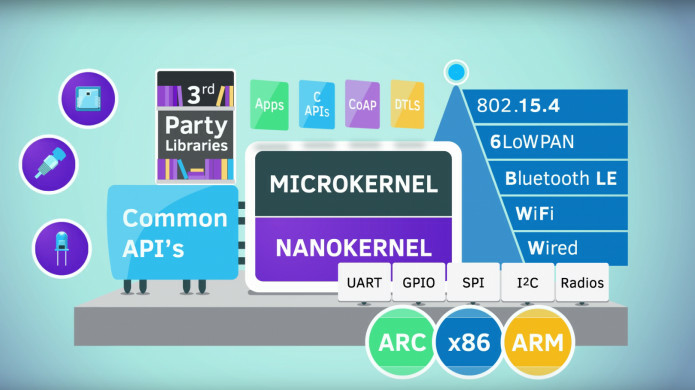 The internet of things requires a small OS - smaller than Linux - so the Linux foundation is endorsing the OS Zephyr. Zepyhr comes with the Apache 2 license so that corporations that shy away from GPL can use it. Many companies do not want to share the changes they add to the OS in these spying times - including industrial spying: the Apache2 license takes care of that. Some of the companies behind Zephyr are :Intel, NXP Semiconductors and Synopsys. The Nano kernel does one thing at the time and requires few resources.